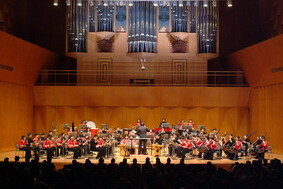 The Taipei Chinese Orchestra (TCO) has long established a high reputation for its versatility and artistic excellence since its foundation in 1979 by the Department of Education, Taipei City Government. Since November 1999, the TCO has been affiliated with the Department of Cultural Affairs, Taipei City Government. In December 2001, the Orchestra moved to its permanent residence in Zhongshan Hall, one of the most famous landmark buildings in Taipei noted for its historical background and acoustical splendor. 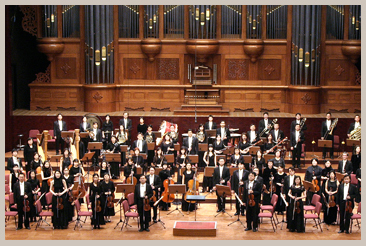 The Zhongshan Hall hosts the Orchestra's home subscription concerts. The Hall includes two performance spaces: the 1,122-seat Zhongzheng Auditorium and the 500-seat Guangfu Auditorium for chamber music concerts. Every year, the TCO touches the lives of close to 100,000 music lovers through more than 50 regular and outreach concerts, as well as the Taipei Traditional Arts Festival, presented between April and June. As a Cultural Ambassador of Taipei, TCO has been very active in international cultural exchange activities. The orchestra has toured Japan, the US, Canada, the Philippines, Malaysia, Australia, Singapore, Britain, Germany, France, Austria, Switzerland, the Netherlands, Belgium, the Czech Republic, China, Hong Kong, and Macao. (1) MRT Ximen Station, Exit No. 5. For more than 30 years, the Taipei Symphony Orchestra has earned a reputation as Taiwan's finest musical ensemble. With the largest number of concerts and the largest number of overseas invitations of any major music company in Taiwan, the TSO has given countless debut performances, and plays in a wide variety of forms, including opera, ballet, theater and symphonies. In addition to its Music Festival and regular Concert Series, the Taipei Symphony Orchestra has been promoting musical education throughout the island. Taiwan's youth and their families are able to discover the styles and characteristics of music through the Family Concert Series. The Orchestra remains involved in community service through outreach programs and free park concerts such as the Starlight Concert Series. (1) MRT Blue Line, Zhongxiao-Dunhua Station, Exit No. 8. Transfer to public bus 605 or 278. Disembark at the TTV bus stop. (2) Public buses: Disembark at the TTV bus stop. Taipei Fine Arts Museum officially opened on Dec. 24, 1983. Located in the Yuanshan district of northern Taipei, it occupies 20,442 square meters of land, and has 11,741 square meters of exhibition space. As Taiwan's first museum of modern art, Taipei Fine Arts Museum embraced high ideals and ambitious goals from the outset. TFAM organizes and plans contemporary art exhibitions, collects and stores works of art representative of the various eras of Taiwan's artistic development, engages in fine arts research and scholarship, and promotes art education and international exchanges. Its objectives are to make art appreciation an integral part of Taipei residents' lives, to foster the development of Taiwan on the international stage, and to help the island stay abreast of the latest trends in world art. Museum Hours: Tuesday-Sunday 09:30 to 17:30. Open on national holidays. Saturday Night from 17:30 to 20:30 Free admission. During the latter half of 2002, the Taipei Municipal Social Education Hall underwent extensive renovation, and has recently begun a new lease on life as the Metropolitan Hall, a professional multi-functional theater with a modern feeling, a people-friendly design and considerate service. Starting from its official opening on March 21, 2003, this world-class auditorium has provided a better performance and recreational environment for arts and culture groups, and all the people of Taipei. Open during scheduled events organized by the Metropolitan Hall, or arts and culture activities to other parties on a rental basis. (1) Take the dedicated Tai Bus tourist bus, disembarking at Meiren Li bus stop. (2) Public buses, Bade Road: 0 East, 202, 203, 205, 257, 276, 278, 605, Zhongxing line, Xinho line (Ruifang-Banqiao route). Disembark at either the TTV or Meiren Li bus stop. (3) Public buses, Dunhua Road: 33, 262, 275, 285, 292, 630, 905, 906, 909, Dunhua Main Line. Disembark at the corner of Dunhua North Road and Bade Road -- either Bade-Dunhua or Taipei Sports Stadium bus stops. (4) MRT Blue Line, Zhongxiao-Dunhua Station, then transfer to any of the aforementioned Dunhua Road buses. The Taipei City Archives are a dedicated, professional educational institution for the promotion of cultural assets and a center for the collection of Taipei City's cultural and historical information. The Archives collect, edit and store previously published documents, as well as interviews of famous individuals and distinguished scholars. Their focus encompasses the broadest imaginable range of subjects, from astronomy to geography, from social conditions, folk customs and individual biographies to arts and literature, historical sites, music and more. Hours of Operation: Mon. to Fri., 9:00 a.m. to 5:00 p.m.
(1) MRT Red Line, Zhongshan Station, Exit No. 2. Approximately 7 min. walk. (2) Buses: 26, 266, 292, 304, Maishuai Community Bus. Disembark at Jiancheng Park bus stop, or Zhongshan TRTS Station bus stop (approximately 7 min. away by foot). In 1928, the Japanese tore down the Chinese provincial civil administration offices, displaying some of the dismantled buildings at the city's Botanical Garden. At the original site, the colonial administration began building a new Taipei Civic Auditorium, a major construction project to commemorate the ascendance of Emperor Hirohito. Work on Taipei Civic Auditorium commenced on November 23, 1932, and took four years to complete, ending on November 26, 1936. The principal designer was Ide Kaoru, an engineer for the Japanese provincial government. A four-story steel-reinforced cement structure, Zhongshan Hall was the soundest building of its day, designed according to modern architectural principles to withstand earthquakes, fire and high winds. The grounds measure 44,532 sq. 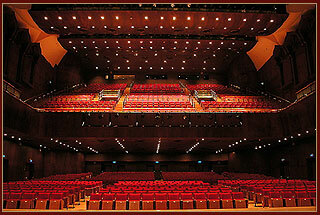 ft., with Zhongshan Hall itself occupying a total of 114,660 sq. ft. Its defining feature was its extremely free architectural form, which made reference to the Moorish style of Spain. In terms of seating capacity, it ranked fourth among Japanese civic auditoriums, smaller only than those in Tokyo, Osaka and Nagoya. Hours of Operation: Tue. to Sun., 9:00 a.m. to 5:00 p.m.